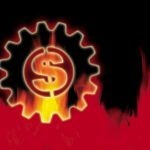 A customer had a problem using their existing gears in a new application. Ontario Drive & Gear provided the solution. Here’s how they did it. 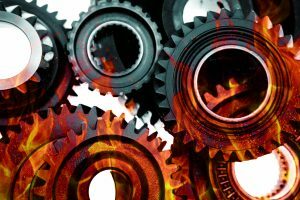 A company approached Ontario Drive & Gear (ODG) concerning a problem they were experiencing with a gear set used in a new application. 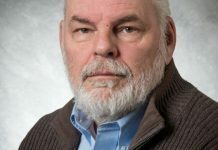 It was found in a speed-increasing drive for a mobile air compressor application, traditionally coupled to a six-cylinder diesel engine. 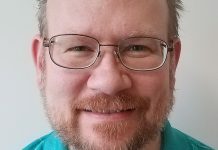 The company had been using them for years without any problems, but due to the recent economic downturn they where forced to seek new applications to increase sales. The customer decided to put these speed-increasing drives on trucks sold in Europe that were equipped with four-cylinder diesel engines. 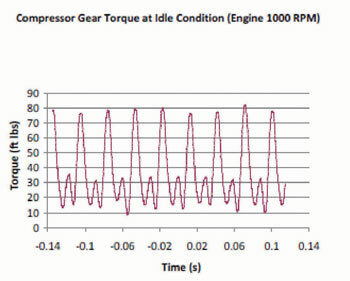 In this new application they began experiencing gear failure after only 20 hours, as shown in Figure 1. Lubrication: Mobil Rarus SHC 1024 synthetic oil @ 0.4GPM rate directly to gear teeth at their mesh point through 0.04-inch diameter orifice. 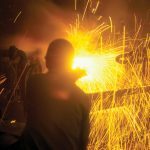 • Oil temperature: 180 degrees F.
The challenge the customer presented us with involved solving their gear failure problem. The expectation was that this gear set must withstand up to 8,000 hours of service life. The gear set needed to operate more quietly, as well. 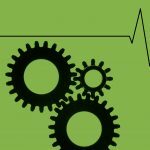 ODG was sent samples of failed gears, as well as unused gears, for reverse engineering and root cause analysis to help sort out the problem while working toward providing a solution. Upon investigation of the failed parts it was evident that there were teeth breaking, as well as micropitting found on the gear tooth flanks. There was evidence of a low cycle bending fatigue failure, as the fracture surface was smooth and had distinct “beach marks” and “ratchet marks” showing the starting point of the crack. 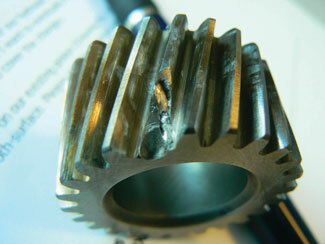 The gear tooth was broken on the large chamfer side of the gear, where it butts against the bearing side of the shaft. 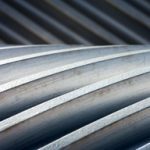 Since this customer didn’t have complete information on the gear set in terms of root radius lead crowning or profile crowning, we reverse engineered the parts to provide details on what the parts looked like at a micro level. Since ODG is a member of Ohio State University’s Gear Consortium, we have access to the powerful gear software Windows LDP (Load Distribution Program), which allowed us to fully model the gear by reverse engineering the parts, taking various measurements as well as inspecting the gear teeth with our dedicated CNC gear inspection equipment. The inspection results enabled us to model the gear in LDP. 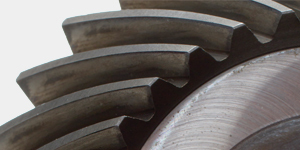 Although these gears were of good quality, it was apparent that they did not have any micro geometry modification, in terms of lead and or profile modifications (Figure 3). 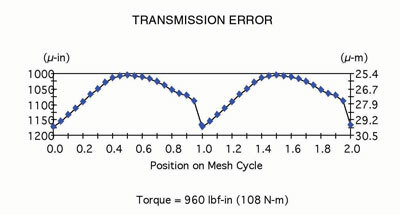 After numerous discussions with the customer, and an investigation into their assembly layout and house manufacturing drawings, we were able to determine that there was possible misalignment of up to 0.15 degrees between the gear shaft and the pinion shaft due to manufacturing tolerances, as well as deflection of the pinion shaft because of an overhung load condition on the pinion. This was also in line with the failure seen on the pinion, showing the load and failure on the end closest to the bearing. 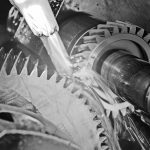 This indicated that the gear was being deflected and/or there was misalignment causing one end of the pinion and gear to take the entire load. We were then able to model this gear set in LDP using this knowledge knowing how much deflection and misalignment there was too see the resultant stress plots. 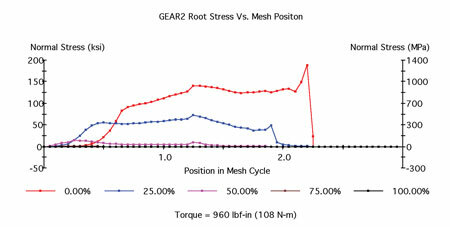 In Figure 5 the first plot shows the pinion bending stress, with a very high bending stress on the side of the gear that was failing. 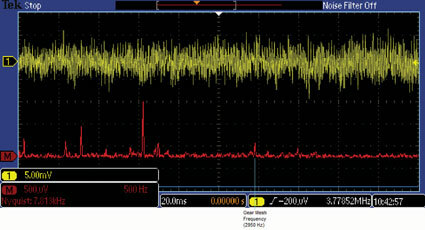 This was taken using the peak torque values from our customer’s testing. The second plot in Figure 5a also shows high contact stress on the side that was failing. 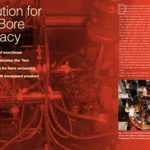 It was evident with this analysis that since the gears where misaligned during operation they where failing due to the excessive stress in the root of the tooth as well as on the gear flanks. For gear noise we look to LDP to establish the baseline of this design. We primarily look at the transmission error plots that LDP outputs, and then use this baseline to try and create a new and improved design. Figure 6 shows the baseline plot from LDP using the peak torque value and 0.15 degrees of misalignment (Figure 6a ). 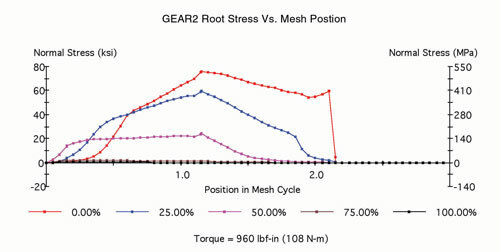 We decided to design a new gear set using LDP in order to control and reduce the stress concentration on the ends of the teeth by centralizing and spreading the stresses to the middle of the gear set, while also considering the gear noise requirement using the transmission error plots from LDP. The original gear set material was SAE 8620 carburized to .012/.027 effective case depth to a surface hardness of 670/770 Hv Vickers. This gear set used a 24 tooth pinion mated with a 58 tooth gear. It was 20dp with 20 degree pressure angle and a 16.7 degree helix angle. The new gear set material is SAE 8620 carburized to .010/.020 effective case depth to a surface hardness of 58/62 Rockwell C. This gear set used a 19 tooth pinion mated with a 46 tooth gear. The gear set was 16dp with 20 degree pressure angle and 18 degree helix angle. 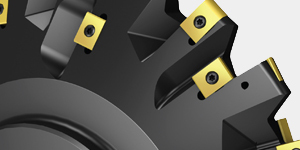 Profile shifts where designed into the gear set so that it was suitable for speed increasing drives. With this new gear set modeled in LDP we were able to look at what adjustment we could make to the micro-geometry that would optimize the contact area and the control of stresses in root of the tooth, as well as control the transmission error that causes gear noise. 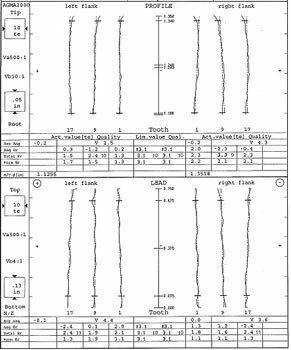 The lead control and profile control charts in Figure 7 Figure 7a are the result of numerous “trial and error” procedures involving different micro-geometry adjustments we made to the design of the gear set. We came up with .0002” lead crown and a .0002” profile crown chart on both the pinion and the gear. With the lead and profile modifications we were able to control the location and amount of bending and contact stress. Figure 8 shows the bending stress on the pinion, with a much lower stress than before. 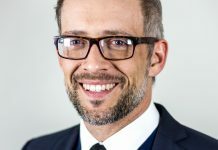 The stress dropped from 188 KSI to 75 KSI, which is 40 percent of the original bending stress, and it is also located in the middle of the tooth rather than on the end. Next we looked at the transmission error plots to make sure they were as good, or better. 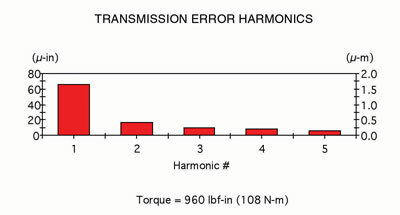 The result was that the peak-to-peak transmission error was 41 percent compared to the original design. 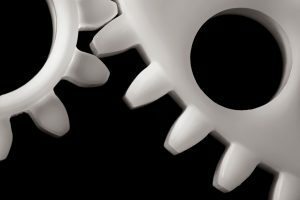 It’s one thing to design gears that perform in theory on a computer monitor. 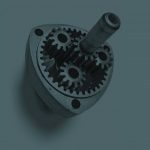 It’s another to produce them with good quality control and as per the designer’s intention, especially with micro-changes to the gear tooth topology. 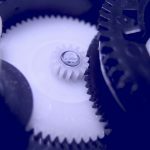 Since ODG has very flexible gear grinding capabilities, it allows us to prototype gears with micro-geometry adjustments using single flank gear grinding and topologic dressing technology. 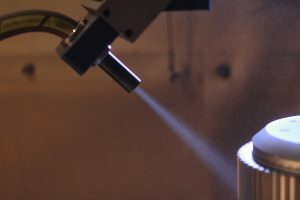 We also have years of experience in quickly making accurate prototype fixtures, allowing us to make a small number of protoypes before committing to the more-expensive production tooling. This allows us to prove out a new design in an efficient and cost-effective manner. 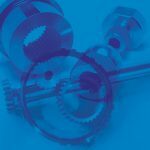 Once the design is proven out we can purchase the high accuracy production workholding and threaded wheels that will allow us to automate our gear grinding process. 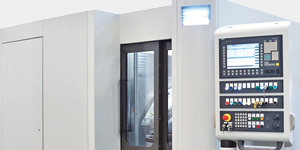 This in turn keeps our part cost low while maintaining high quality throughout. 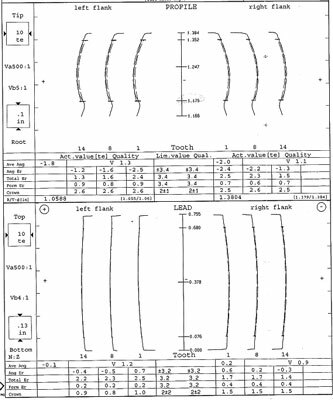 Figure 11 is an example of the elemental inspection of our lead and profile gear quality chart from one of the prototype pinions. 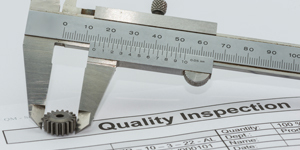 Testing and validation was completed by the customer, who shared their findings with us. Testing was completed with 15.2 million cycles at pinion shaft for the highest torque amplitude, as in fig. 2. It was also cycled more than 1,000 engine on/off cycles to test for shock load. Pinion and gears were then inspected for any crack initiation, and nothing was found. Sound testing was also perform to validate that the parts were as good, or better. Six units were assembled with ODG gear sets and sound tested, and all passed without any gear whine. 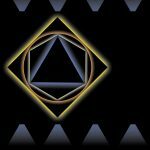 The average reading was 95.1 dba, with a spread of 1.9 dba between all six tested. Six regular production units where tested with the old gear sets. The average was 96.6 dba, with a spread of 4.1 dba between them. The average drop in dba level between the ODG gears and the current production gears was 1.0 dba, on average. Since this test takes readings of sound levels that are affected by the compressor rotor and other background noises, we wanted to look at how much the gear mesh frequency amplitude changed. Figure 12 shows an FFT (Fast Fourier Transformation) graph (in red) of the original production gear set, showing the gear mesh frequency at 3803 Hz. There are also “side bands” to the left and right of the gear mesh frequency. The other high peak is the compressor rotor frequency. In this test the gear mesh frequency was higher than the compressor rotor amplitude, and you could detect the gear whine. 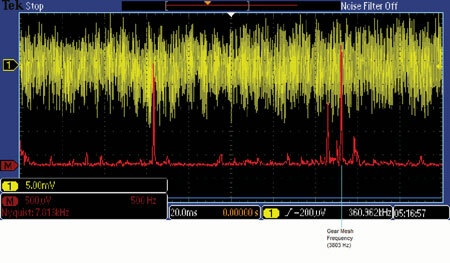 Figure 13 also shows an FFT graph of an ODG gear set showing the gear mesh frequency at 2950 Hz. 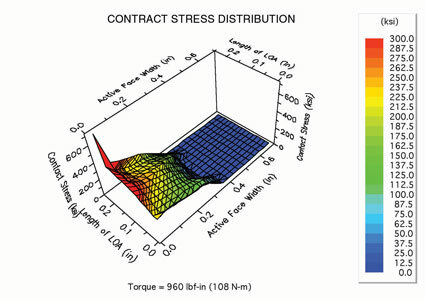 The higher peak to the left is the compressor rotor frequency, which is much higher than the gear mesh frequency. 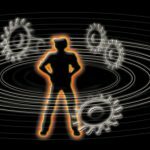 In this test you could not pick out or hear gear whine. Both tests where performed around the same pinion rpm, with the original gear set at approximately 9507 rpm and the ODG gear set at 9316 rpm. 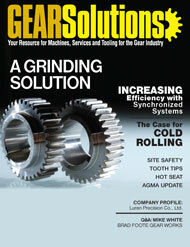 With ODG’s experience in gear applications, failures, and gear noise, coupled with Ohio State’s Gear Consortium Windows LDP software and the flexibility of our gear grinding capabilities, we have a winning combination that allows us to design, develop, and produce excellent gears that solve our customer’s problems with respect to failures and gear noise problems. 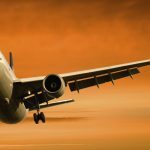 The customer cited in this case study has just given us clearance to begin full production of these parts, in fact, as they now have full confidence in the solution we provided to the challenge they faced—which we overcame together. 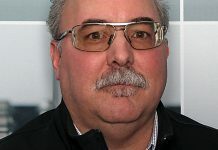 is a gear designer at Ontario Drive & Gear Ltd. To learn more call (877) 662-2840 or go to [www.odg.com].